I have finally arrived at RootsTech 2013, my first ever trip to Salt Lake City. Some of you will know, from my Twitter feed, that I am no stranger to business trips to the USA, so arriving here on business feels quite familiar and comfortable. The most challenging aspect of my travel yesterday, was the three and half hours spent queueing at Dallas airport to get through immigration, then customs and finally re-entry through security for my onward flight to Salt Lake City. However, today has more than made up for any inconvenience suffered yesterday. I spent most of the day at the APG Professional Management Conference, along with fellow genealogist, Marie Dougan, of Ancestral Consultants. In the morning, we had a most interesting session on American court records, given by Judy G Russell, of Legal Genealogist fame. Many of the lessons of this hands-on session, although using American court records, could easily be applied to UK court records, so I now feel inspired to try and use these more in my own genealogy practice. Over lunch it was great to chat to Lynn Broderick, who blogs at The Single Leaf, whom I had met in February at Who Do You Think You Are? Live and Thomas MacEntee, of Geneabloggers. In the afternoon I attended two fabulous genealogy marketing sessions: First of all, Thomas MacEntee, of Geneabloggers, talked about how to run an effective marketing campaign, largely based around new media marketing such as Facebook, Twitter, blogs and Pinterest. Thomas gave us lots of ideas on how to improve our social media presence, not least by using analytics more. 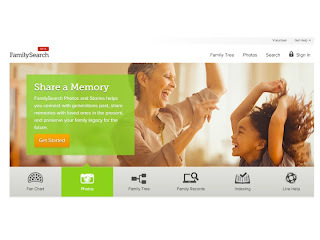 Then Lisa Louise Cook, Genealogy Gems, showed us how to use YouTube in our genealogy marketing, which was very timely as I hope to be incorporating some videos from RootsTech into this blog over the next few days. Finally, a special mention to Jill Ball, of Geniaus, who has been doing a fab job of looking after me as a new official blogger. Watch this space for more details - and don't forget to watch the live streamed RootsTech sessions here to find out more! So great to meet you at last Rosemary and thanks for your kind words. 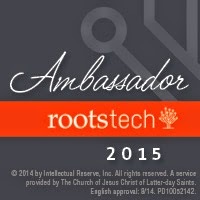 I'll see you at dawn tomorrow for our tour of the Rootstech Exhibit Hall. It certainly is a wonderful feeling to connect with fellow genealogists from across the globe. Can't wait to read your posts and view your You Tube videos! Thanks Patricia, I hope I live up to your expectations! Thanks for the mention, Rosemary. It's been great visiting with you on both sides of the pond :-) I hope you continue to enjoy your stay in Salt Lake City! Thanks Lynn, I had a great time in Salt Lake City. It was great to catch up with you again - good luck with the blog!